June is the month we begin to celebrate patriotism. 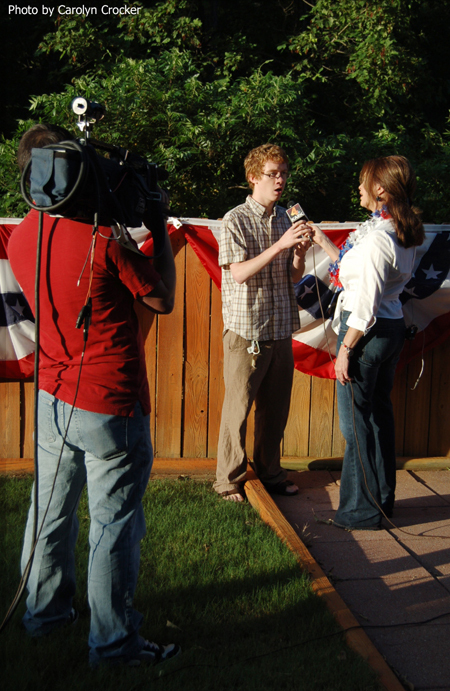 On June 4 Arkansas’ FlagandBanner.com owner, Kerry McCoy, started her morning early with KARK Channel 4’s co-host Tracy Douglass to show the viewers how to “Do The Red White and Blue.” Kerry and her team decorated the exterior of Tracy Douglass’ house for the upcoming patriotic season. The first two segments centered on the decorations in the front yard. 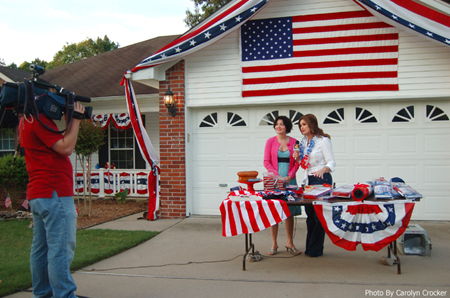 They draped the outside of her garage with a patriotic swag of red white and blue bunting that framed an American flag. Lit patriotic citronella candles and U.S. stick flags decorated her garden. Her porch eaves featured full fans with wind chimes, and her porch railing repeated the patriotic sway of bunting used above the garage. The last segment illustrated ways to decorate the backyard, the favorite place for 4th of July family gatherings. The back porch was outfitted with stars and stripes pulldowns and full fans, and more full fans and a U.S. flag kit adorned her fence. Kerry and Tracy also showed viewers the wide variety of products offered at her company, Flagandbanner.com from cake stands to patriotic bikinis and sunglasses, to flagpole brackets and pole kits. The morning segment ended with the National Anthem sung by a special guest, Kerry’s son, Grady McCoy, a voice student at Indiana University.